Commanding Chitungwiza Police District Chief Superintendent Sekayi Mujiwa says protestors that laid siege on Makoni Police Station in Chitungwiza, burning cars and destroying windows on Monday last week, had planned the attack and appeared to have received prior training. Police have since arrested 114 suspected protesters and are closing in on the remaining suspects. Narrating the horrifying events, Chief Supt Mujiwa said protestors surrounded the police station at around 11am and confronted passengers who were in three buses that had sought refuge outside the station. He said they ordered the passengers off the buses and robbed them of their valuables before torching the buses one of which they used to block the main gate. "After burning the buses, the marauding crowd that was armed with stones and petrol gained entry into the police station after pulling down the fence and torched vehicles belonging to police officers and a Natpham refrigerated truck which was carrying medicines. "To show that this was a planned thing, the protestors were being controlled by their leaders who gave signs which were easily understood by the crowd," he said. "When they gained entry, they started stoning the police station and burning cars and police fired several warning shots but the crowd was not deterred as they kept coming with children and women leading the charge. The children were the ones who torched several vehicles." He said more than 200 children participated in the violent protests. "We have gathered information to the effect that the organisers gave children Ganja cakes and elders alcohol and other drugs. "I have never seen such determined violent protestors in my whole career. They kept advancing until a reinforcement from Support Unit arrived. By that time they had already destroyed the windows at the entrance and around the police station." Chief Supt Mujiwa said drills exhibited by the assailants showed that they had received some prior training. He said the protestors also had the audacity to destroy the only robot in the satellite town. "We managed to apprehend the suspect and he has since appeared in court where he was denied bail," he said. After fleeing from the reinforcements, the protestors went to the neighbouring VID depot where they gained entry after destroying a palisade. They shattered all the windowpanes and set ablaze three vehicles belonging to VID and one belonging to a civilian. Depot manager Ms Brigete Chimhau said workers watched helplessly as their property was being destroyed. "The protestors had earlier burnt tyres in front of our gate and we had to close it but we remained in our offices. More than 1 000 people entered our premises and started destroying property stoning every glass and burning cars," she said. "The other staff managed to escape through the back door but I could not so I locked myself in the office. I feared for my life as I heard the people ransacking other rooms and destroying furniture in the building. I had to wait for over 30 minutes to get to safety." 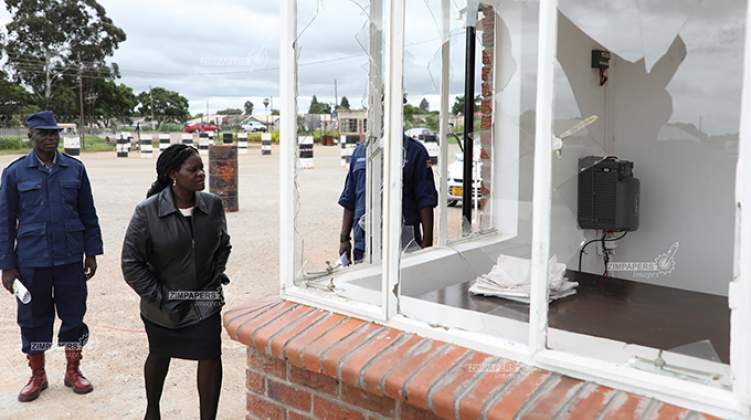 Ms Chimhau said the protesters took several hours to ransack the depot and the depot cannot offer all services. The looting trail later spread across the town, with Chitungwiza Town Centre, Makoni and Chikwanha shopping centres among the most affected.